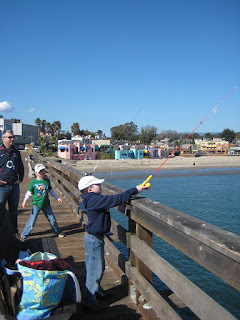 A few weeks ago Finlay went to a birthday party where the entertainment was a fishing trip to Capitola. He came back with a fishing rod and a new enthusiasm! We got Adam a rod and they have both been practising casting in the pool. 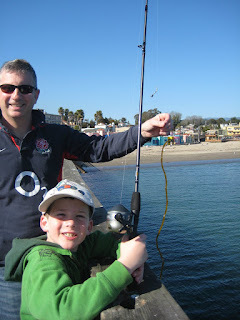 Last week the boys both got good school reports, so as a reward we took them over to the sea for a family fishing expedition. 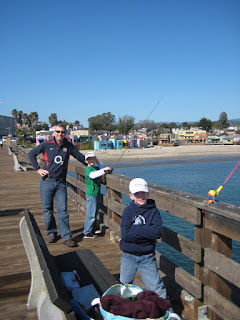 The weather was glorious - here we are baking on Capitola pier, in the background you might be able to see folks swimming from the beach. Finlay in particular was very keen to show off his prowess..."watch carefully Mummy while I demonstrate again"...they loved that I was useless at the casting. 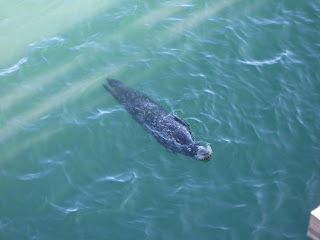 We had plenty of visitors: this fellow hung around for a while, and we also saw seat otters as well as lots of birds. Did not diminish the enjoyment - and we had our fish with chips for dinner at the restaurant on the pier. It's knitted in Rowan Felted Tweed in colour SH153 held with Rowan Kid Classic in colour 832. I used 4 skeins of the felted tweed (764 yards) and 5 of the Kid Classic (765 yards). I knitted it almost according to the pattern, although I cast on 10 more stitches for a little extra length. I also knitted the rufffle until the yarn ran out - rather than for 5" as specified in the pattern. I fastened it with a carved stick that I bought at Stitches. The finished wrap is lovely and snuggly and I think I will wear it a lot (since I wear my clapotis wrap a lot), but it was terribly boring to knit! The stockinette portion was OK as it was quick and besides, I was looking for a boring project, but the ruffles took an eternity and I hate to knit rib! I had to buy an additional needle to knit this so bought a 10.5 mm harmony wooden tip from Knitpicks. It was quite a pointy tip, which was good for knitting two strands of yarn, and I was really impressed by how smooth it was to knit with. So overall a successful project, which thanks to my teleconference, was completed in just over a week. 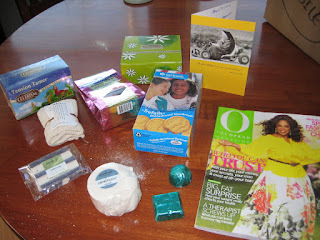 It's a 'spa day' kit that my boss had put together; bath goodies, body lotions, chocolate, herb tea, cookies, magazine...everything I needed for a wind-down day! She is a working mother and I think truly understands what I would appreciate. The Lamborghini dealership in town has closed down. I squeaked into February with my Feburary lady sweater - I sewed the buttons on March 1st - but finished the knitting the night before! As I post this I am reminded yet again that I need to organize some more flattering photos of me in my handknit garments! This is about the worst - bed hair, clashing colours. 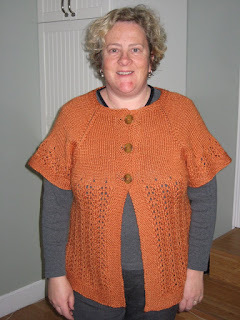 poor lighting...still you can see the cardi quite well. In fact I was prompted to get Nigel to take another photo of me in the sweater in some more complementary colours (above). I am pretty pleased with this cardi; I used stash yarn and I think its a useful garment. 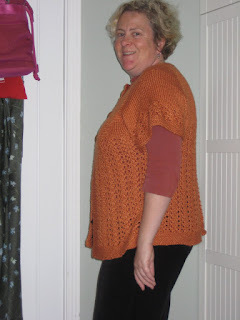 I wear my Loppem cardigan a lot which prompted me to knit the FLS with short sleeves. 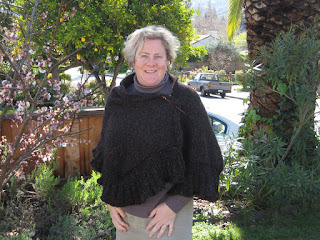 As the FLS is knit top-down I could try it on and then stop the sleeves at a point I felt was best. 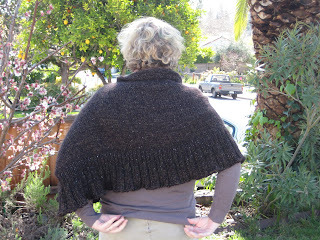 It's quite swingy and I think the yarn (Elann Highland Silk) was a good match for the project. 12 years ago, on March 1st 1997, I moved to the USA. I arrived with 2 cases and moved into my rented house which at the time contained 1 bed, 1 plate, 1 mug, and a kettle! I sat on the floor in my living room and cried, things have got a lot better since then! 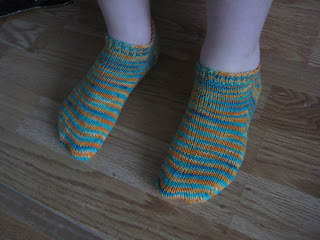 I knited up the yarn that Adam dyed a few weeks ago. At his request they are super-short socks...which always makes knitting for him quick. He immediately wore them to school, and was pleased to tell me that one of his friends wanted some. Adam explained that his friend could dye his own yarn with Kool-Aid.